...if it's too bitter, if it's too bloody, if it's too violent, if it's just too much...and if you would rather have heard Jesus say "Take up your chocolate cross and follow me", then here you go. I have a feeling that it's the kitsch kinda stuff like this that contributes to people hating, despising, mocking and shunning Christianity in the West. A chocolate cross, for God's sake, have we lost our freakin' minds? My goodness people, if you are a Christian and this doesn't offend you, you need to question your beliefs!!! Seriously, we sit around and gripe and complain about people taking "Christ" out of Christmas and then replacing the cross with the Easter Bunny but we don't say anything about this!?! Is this what Christianity in America has come to? 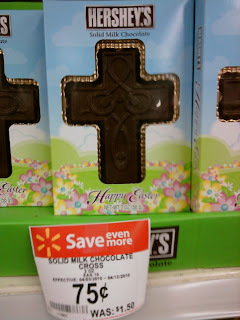 What will shut us up, satisfy us and keep us appeased is a chocolate cross on the shelf of the grocery store? For some, this probably seemed like such a great gift to give to the their pastors/preachers. Well, I'm here to tell you that if you have a pastor worth his weight in salt, he will have been highly offended by this. So, I imagine the next battle for so-called Christians here is when the symbols of Islam start getting made into chocolate and then we have to start trying to outdo our "competition". Wake up Christians!!! For the freakin' love of God, get fired up about this stupid crap and start doing things that make people want to love Jesus rather than laugh at Him and us. And oh, just in case you didn't notice, this picture I took was indicative of the cross in our culture in a completely different way: after Easter, it goes down in value to most people!!! The cheap, falling price of the cross. I'm disgusted!! !